There are currently 31,484 users on this website. 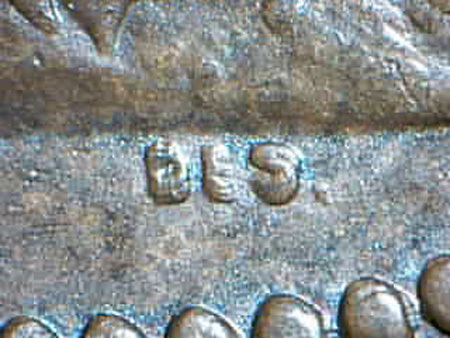 I received this coin in my mail, and while looking at it with my 5 power loupe, I could easily see that all the letters on the obverse were tripled, both at the top and the bottom. I need some help with this, as I am not familiar with this kind of doubling. Most of the letters have the "notching" associated with true doubling. I did not want to post all pictures, but these should give you the idea. Please notice the designers initials are also clearly doubled. It's machine or Mechanical Doubling .. yours is pretty minor. Caused by when the die either slightly bounces or slides as the die pressure is released. Thanks. I thought it might be , but I couldn't account for the tripling on both the top and bottom of the letters, especially as it happened in a completely circular fashion. I could accept a sideways motion, or an up and down motion, but to be so centered while not disturbing any portion of the central motif had me puzzled. The "I" is interesting looks trippled. Is it a tdo? this looks like a die that was at least trippled, its pretty impressive too! feel free to call me Will. I'm a 18 year old collector from Mississauga, Ontario. my PMs are always open, whether you have a question or simply wish to talk. I don't think that it is the die .. these anomalies were caused during the striking process. Bill, you could not be more wrong, and honestly your misleading comments are doing more harm than good. Did you even study the images up close? 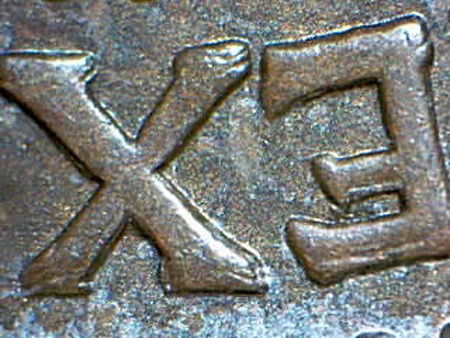 That notching, thickening of the devices and splitting of the serifs is diagnostic of doubling during punching of the die. Go back and read the Stanton paper on doubling - it is impossible to split serifs with Machine Doubling (unless the devices are incuse on the coin - but that is an entirely different animal). This Edward cent is a tripled die!! I was not aware of that in the 1909 coinage, but frankly I am not surprised. The Edward VII and George V large cents are understudied and I suspect more doubled dies are yet to be discovered. "If you going to err,do it with flair . That way you'll remember and not repeat the mistake"
Looks like a tripled die to me too. Very nice coin. The OP was nearly 3 years ago, and I would have had a different view if it was posted now.... it's NOT MD, Mechanical Doubling. I think that I must have just glanced at things when 1st posted ... the "IM" section is the dead give-away. I'll look at some of my '09's to see if I find anything. I normally don't even look at the Obverse .. only for R/P'd dates. OK, I looked at the 1909's that I could find easily and got 14. 9 of them have the same doubling and the other 5 look to be as well, but are too worn to see the serifs cleanly. 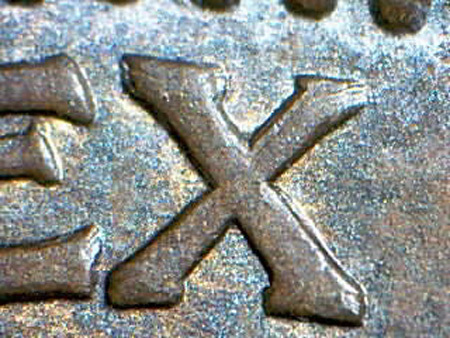 3 of the those 5 worn ones appear to be a hub-double as well, and the last 2 are too worn to see anything clearly at 40X. I suspect that ALL the Obverse working dies are from the same hub .. it's not hub-doubling. The hub itself was doubled coming from the matrix in my opinion. Just based on what I found in my 1909's, EVERY 1909 would look the same as the OP, so it's not a million dollar coin. I did not see the original post but I think it is a million dollar coin. Triple hub in my opinion. Thanks for bringing it up again. I remember seeing a mint state 64 one on e-bay a while back that wasn't advertised as any type of doubling or tripling on it, it was a buy it now I think around $300.00 - $400.00 was the asking price. The price was more than I wanted to spend it ran for couple of months finally someone purchased it. 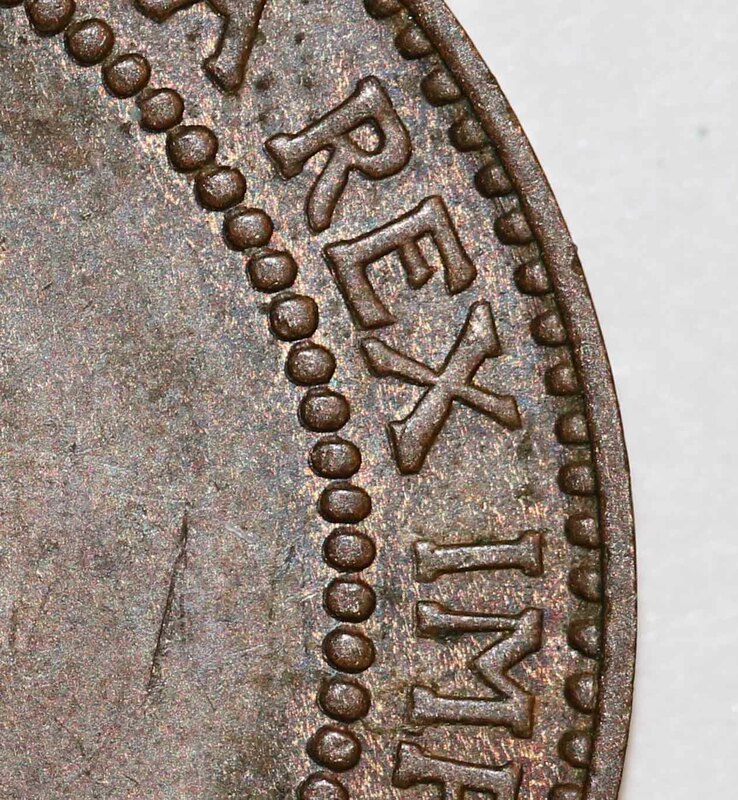 I don't have a lot of Edward large cents, but in looking at the ones I have it seems like more of the 1908-1910 coins have obverse legends with thicker lettering at the tops and bottoms even when they don't show splitting of the serifs. 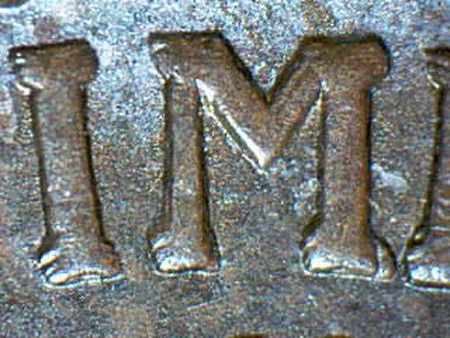 The earlier coins I have generally show thinner serifs. 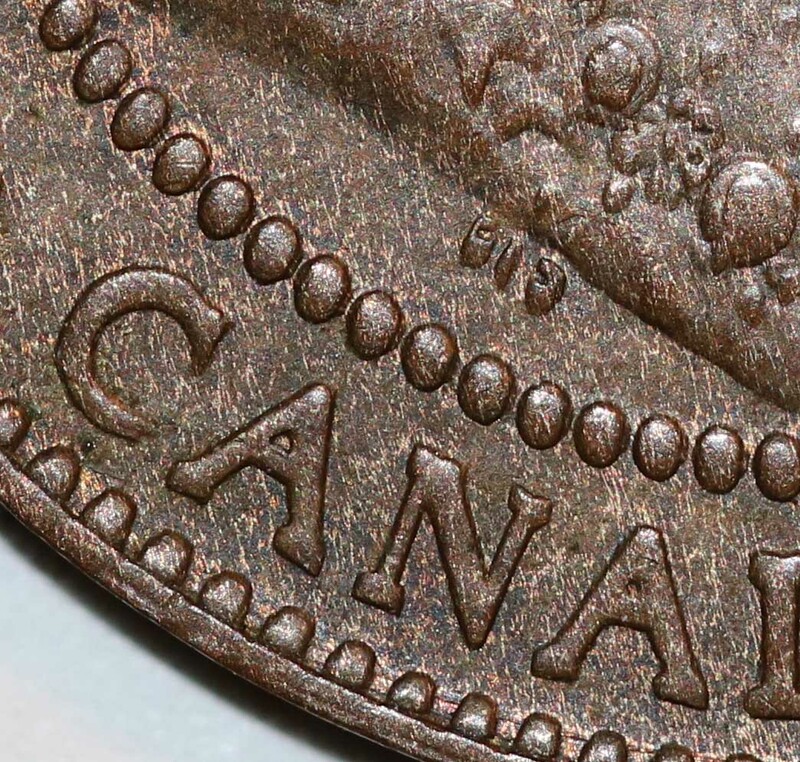 Could Ottawa taking over the coinage in 1908 have something to do with this? I think that Ottawa is the reason for this. I thought along the same lines when all of my '09's showed essentially the same. 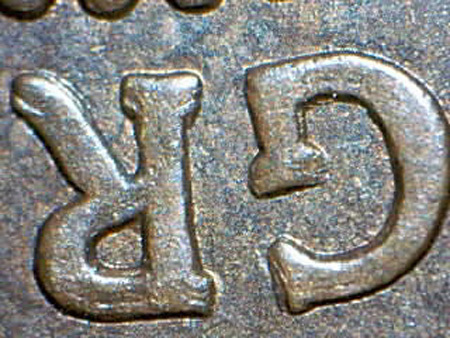 Here are a couple of pictures of the thicker serifs on a 1910 cent. The designers initials are stretched out also and many of the beads are oval shaped. It took 1.01 seconds to rattle this change.